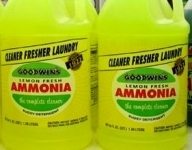 Ammonia is a colorless gas with a very distinct odor. Ammonia gas can be dissolved in water and becomes the so called liquid ammonia or aqueous ammonia (ammonium hydroxide). Once exposed to open air however, liquid ammonia quickly evaporates and turns into the ammonia gas. Ammonia is a very toxic substance that is potentially fatal. Do not get misled by the manufacturers’ statements that low concentration or diluted products are “safe”. The toxicity is just the same, but only the symptoms get “diluted” and less recognizable. It still causes the same kind of damage to your body tissue. Ammonia is hazardous by all routes (i.e. dermal, ingestion, inhalation), with the liquid capable of burning the skin, causing permanent eye damage, or corroding the digestive tract upon contact. The gas is capable of causing severe eye damage, pulmonary edema, and even death from spasm, inflammation, and edema of the larynx. It has been indicated that ammonia can be particularly harmful for people with liver problems. When in individual’s liver functions are greatly reduced, any source of ammonia, such as inhalation can lead to hepatic coma. Household ammonia (5 to 10% ammonia) rarely causes serious burns, but is irritating to the eyes, nose, throat, and tracheobronchial tree. Rarely, deliberate suicidal ingestion has resulted in esophageal burns. Agricultural ammonia is usually more concentrated and may cause irritation and severe burns of the eyes, lungs, upper airway, and skin. When heated to decomposition, ammonia emits toxic fumes of ammonia and oxides of nitrogen. Important: The mixture of ammonia and hypochlorite bleaches results in formation of chloramine, which causes a toxic pneumonitis (pulmonary edema) following inhalation, and may produce residual pulmonary function abnormalities. Household ammonia is a general purpose cleaner - used in window cleaners, tile and floor cleaners. Because ammonia results in a relatively streak-free shine, one of its most common uses is to clean glass, porcelain and stainless steel. It is also frequently used for cleaning ovens and soaking items to loosen baked-on or caked-on grime. Multiply brands of hair colorants, Brasso Multipurpose Metal Polish, Brite Floor Care, Floor Science Floor Cleaner, Loctite Crafter's All Purpose Adhesive, Loctite Fabric Glue,Parks Adhesive Remover, Parks Pro Liquid Paint Stripper, SOS Ammonia Glass Cleaner, Mr Clean Top Job, Safeway Windows, Parsons Ammonia Kitchen Cleaner, Crystal Care Liquid Glass Cleaner, Lysol Brand II Disinfectant Spray, STP Son of A Gun Car Cleaner, Fiberglass Magic Cleaner, Carpet Stain Remover, Arm & Hammer Deodorizing Air Freshener, Americas Home Value Glass Cleaner, Champion Sprayon Glass Cleaner, Wrights Jewelry Care, PAR Ammonia Spray Glass Cleaner. Cosmetics: Avon Keep it Fresh Multivitamin Toner, Ponds Age Defying Complex and Eye Cream, Noxema Skin Cream, Noxema Instant Shave, Noxema Shaving Cream, Avon Clearskin Targeted Blemish Remover, Ponds Age Defying Complex, Cover Girl Remarkable Mascara, Cover Girl Crackle Lacquer, Revlon Colorstay Lashcolor, Revlon Eyelash Mascara. And many other products.